I have written this article for 3 reasons: as an aide memoir for our visit in April 2016; for those who have been to Isandlwana and Rorkes’ Drift, it may be of interest and rekindle memories; and for those who have not been, or know little about the Anglo Zulu War of 1879, to encourage you to consider a trip and, if so inclined, to provide some practical guidance. On Tuesday 26 April 2016 Liz and I arrived at the the Isandlwana Lodge for a 2-day tour of the Zulu battlefields accompanied by top guide Rob Caskie. There is a fuller version of the background, starting with my primary school in 1971 and covering my school contemporary David Rattray who through his Fugitives Drift Lodge put these Anglo Zulu war battlefields on the map in the late 1990s and became world famous. The forward to David’s book “A Soldier-Artist in Zululand” is from Prince Charles with whom David formed a close friendship, with David frequently staying with Charles at Balmoral Castle. Not bad a for a boy from the St Albans Pretoria class of ’75 of which I too was a member. 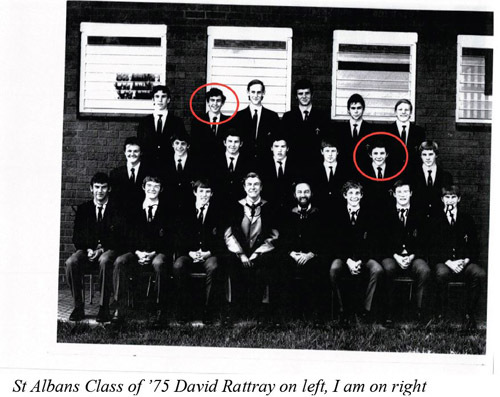 David (nickname the Rat) and I got along very well at school but we were not close mates; we were in different boarding houses, a major factor in determining schoolboy friendships, and I concentrated on ball sports whereas David was a long distance runner and a free spirit. We had a 30-year school reunion in 2015, and David was the star. I reiterated my intention to visit Fugitive Rift Lodge and have him guide me around the Zulu battlefields. On Australia Day 2007 in Sydney I commented to my parents in law parents that I was keen to firm up the Zulu battlefields tour with David. Later that day there was the numbing news that David had been murdered the previous day. It made headline news throughout South Africa and the UK – every major UK paper plus the Economist published an obituary. I decided in 2016 to fulfil my long held intention to revisit the Zulu battlefields, with Rob Caskie (see www.robcaskie.com) as our guide. Rob is world renown as storyteller of the Zulu battlefields, having worked very closely with David Rattray for several years. Rob recommended two days. So on the evening of 26 April 2016 Liz and I found ourselves at the Isandlwana Lodge (www.isandlwana.co.za) overlooking Isandlwana. Waking, the view from our room was stupendous. 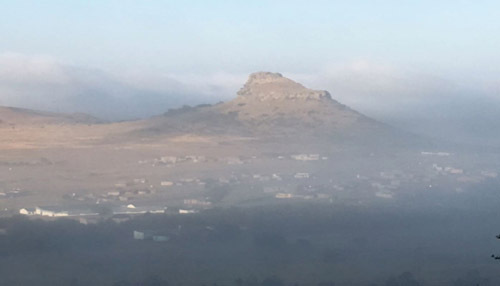 The previous day’s rain was replaced with a low mist in the valley below us and peeking out on our right the sphinx like Isandlwana mountain. 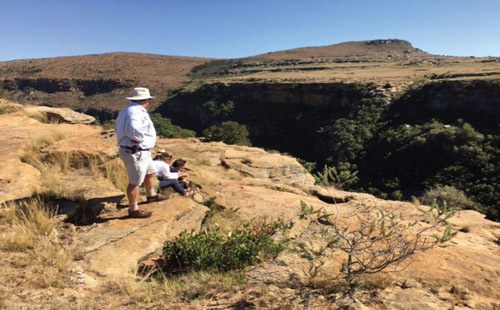 Rob started us on the Lodge veranda with a background briefing on the origins of the Anglo Zulu war. I do not propose reiterating the history; numerous books and other information are available. I had read many books beforehand, and one of the great benefits of having Rob there was being able to obtains his expert views on numerous issues, and shed light on so many of the ambiguities, complexities, myths and inaccuracies surrounding these events. We then piled into Rob’s trusty vehicle and journeyed about 1km to the top of the Nqutu Plateau to the spot, marked by a tree, from which the Zulu commander, 70-year-old Ntshingwayo kaMahole Khoza, commanded the Zulu forces throughout the battle. Rob pointed out the major movements of soldiers on both sides, especially the various regiments of the Zulus, and gave us an overview of how they applied their Horns of the Buffalo strategy to encircle the British soldiers in a deathtrap with no escape. Rob pointed out the dead ground into which the Zulus would descend at the start of the battle proper –one of innumerable landscape subtleties which would escape the untrained eye and are only revealed through an expert guide. Descending from the plateau, we stopped at the dead ground, imaging the courage of those Zulu warriors lying there ready to charge with only cowhide shields and assegais (short broad bladed stabbing spears) against highly trained and seasoned soldiers, armed with Martini Henry rifles, and part of the then arguably most powerful military force on earth. We then drove onto the battlefield itself where Rob seated us beneath an acacia thorn tree and began his storytelling proper. History came alive as the story was revealed. We felt we were there when Rob embarked on the Zulu war cries which came from deep within him; the numerous Zulu names rolled evocatively of his tongue and when Rob used his trademark walking stick to imitate the Zulu stabbing accompanied by guttural cries of “Unsuthu!” and “Ngadla!” we involuntarily ducked for cover. The battle was considered at that time the most catastrophic defeat ever inflicted on the British Army. 1397 British army soldiers died at Zulu hands. Zulu hands is an accurate description; although some Zulus did have rifles, they were few and far between, so the vast majority of British casualties would have been stabbed to death. A gruesome end as, in accordance with Zulu tradition, having “washed their spears” in the blood of the enemy, the Zulu warrior would liberate the spirt by disembowelment. Not one British soldier on the field survived. Rob takes you through the the litany of blunders made by the British, particular Lord Chelmsford who had overall command of the British army in Zululand, and those made by Colonel Pullein who was left in charge of Isandlwana. But make no mistake, this victory was due in very large part to the superb tactics of the Zulu leadership combined with the extraordinary courage, discipline and physical endurance of the Zulu warriors. They had run, barefoot, about 100 miles over the preceding 4 days to reach the battle, and then overcome a ferocious and brave foe bearing way superior arms. Two special memories remain with me from that morning at Isandlwana. One was finding the protruding femur bone of one of the British soldiers, untouched and unseen for 137 years since he was buried in 1879. The other was exploring with Rob to find the “Wagon Driver” rock painted by William Whitelock Lloyd as related in David Rattray’s remarkable book “A soldier-artist in Zululand – William Whitelock Lloyd and the Anglo Zulu War of 1879”. And find it we did, but not before an extensive search which came close to abandonment. After lunch at the Lodge Rob drove the approximate 20 km, across the Buffalo River at Rorkes Drift to Fugitives Drift Lodge and into into the Buffalo river valley. The story of Fugitives Drift is an epic in itself. It is the tale of Melvill and Coghill’s attempts to save the Regimental Colours and is one of incredible bravery, courage, good luck, bad luck, honour, valour and with a little skullduggery thrown in – Higginson, you know who you are. Read about it in your own time or let Rob relay it to you. After viewing from the rock on to which the principal characters were swept by the raging Buffalo River, and Rob while explained in detail what happened, we walked the short journey to the graves of Melvill and Coghill to pay our respects to these brave men. On the way back Rob took us to a spectacular a viewing point; below us the Buffalo River, across on the far side of the rock where some of the fugitives had got caught and across the valley on our side the late afternoon sun spectacularly catching the river valley cliffs. One can do Isandlwana and Rorkes Drift in one day. However, the advantage of two days is that one is less rushed and can absorb much more of the sites and atmosphere, at relative leisure. On our second morning we set out with Rob to find the Ngbwabeni valley where the 25,000 Zulu impi had been hiding on the night and morning of the battle of Isandlwana. This is not even a road less travelled; after turning off the dirt road there was no road whatsoever. Suddenly in front of us was this huge valley in which one could readily believe a disciplined army of 25,000 warriors could hide. From there we traversed southeast, across the land where the left corner of the Zulu impi had crossed before engaging with Colonel Durnford’s contingent (and what a story is Colonel Durnford, and thanks to Rob for correcting my misunderstanding), and to the Mangeni Falls for a coffee and crunchie break. We had coffee at almost exactly the same spot as Lord Chelmsford had similarly been having a tea break on that 22 January 1879 morning at the same time, as unbeknown to him, the Zulus were invading his army at Isandlwana. 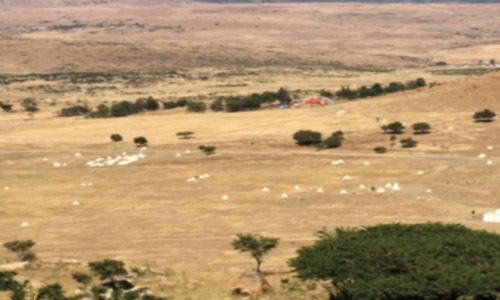 Rob showed us the nearby Silutshane Hill from which Milne viewed the Isandlwana camp via telescope and reported back to Chelmsford that “All is okay as the tents have not been struck and the cattle were going back into camp”. As Rob pointed out, some very important life lessons in this; Milne was correct in what he saw but completely wrong in the conclusions he drew. On our return to Isandlwana Lodge Rob dropped me off at Durnford Donga and I spent a few hours wandering on my own through the Isandlwana battlefield. I kept off of the beaten track, in hope that I might stumble across something. I did find what looked to me like an old cartridge but close subsequent identification by Rob disabused me. I walked down part of the Fugitives Trail. I saw Younghusband’s memorial. His troop were the last to be killed after they ran out of ammunition. A Zulu survivor relayed that when the Zulu commander realized this he ordered his men to suspend hostilities to allow Younghusband to shake hands with all his men. They then fixed bayonets and charged down the hill into the Zulu warriors and history. I clambered up to the Last Man Cave where the last British soldier killed in the battle had ensconced himself with rifle. The bullet marks are still very clearly identifiable on the cave walls. If there is anything the average person is likely to know about the Anglo Zulu War 1879 it is the battle of Rorkes Drift. This is thanks in part to being a famous British victory – 11 Victoria Crosses awarded in one day which is more than in any other British military campaign including two world wars – and also because of the movie “Zulu”, made in 1964 starring Stanley Baker and launching the career of Michael Caine. Again, it is not for me to describe in detail what happened. Suffice to say, 135 British soldiers and civilians, of which about 30 were invalids and in the makeshift hospital, held out with relatively low casualties against an invading army of between 3,000-4,000 Zulus. Bravery and heroism all round. The conventional history books tell of the heroism of the commanding officers, but what Rob was able to bring to life is the truly extraordinary bravery of the rank-and-file soldiers, many of whom were in their early 20s and had never before been in battle. Rob takes you through the hospital battle room by room, gory incident by gory incident. Many know of Chard, Bromhead and Dalton; fewer know the true stories of heroes like good Welshmen Privates Robert Jones, William Jones, John Williams and Henry Hook the cook, who imprisoned in the hospital rat hole is reckoned to have bayoneted 14 Zulu warriors to death. And conventional history books will also not tell you is what happened to the survivors of Rorke’s Drift. Rob did, as well as the long lasting effect of this battle on the survivors on both sides, British and Zulu. As Liz commented, when you hear about the subsequent dysfunctional lives of many of these heroes and the impact on their families, you realise war has far greater consequences than the immediate impact on those fighting. Rorkes Drift is only the size of 5 tennis courts; within that small area history, heroism and humanity are writ large. The single most important factor is to try to ensure a good guide. I am obviously biased and would seek to go with Rob if available. The ideal number for a trip with Rob is between 12 -14, as a group this size generates its own excitement and interest outside the formal storytelling and battlefield visiting times. Rob is a freelance storyteller very much in demand not only for the Zulu Wars but also for Antarctica and corporate engagements. If you are thinking of going, contact him early on and try to lock in arrangements as far in advance as possible. It is strongly recommended to spend two days. You can do it in one day but given the distances to get there and everything there is to see and absorb, it would be senseless to cram it into one day if two days were available. Access is via Johannesburg – about a 5-6 hour drive or from Durban, about a 4 hour drive. On the itinerary, what we had was close to ideal. The only change I would make is to build in time to walk the Fugitives Trail itself. This is about 6 km from Isandlwana to Fugitives Drift at the Buffalo River, and with enough notice and assuming one is reasonably fit this can easily be arranged. In terms of the time of year to go, the battle itself was in January. However, the summer days can be very hot and rain can intervene. So the ideal time is March/April through to end October. • Isandlwana Lodge. This is where we stayed. The physical infrastructure is very impressive, the view awe inspiring, the rooms very comfortable and the food and drink commendable. It seems, however, that the resort from a marketing and occupancy level it is having some major issues, with few other guests there when we stayed. I very much hope it survives and thrives, and certainly if one went with a sufficiently large group we could make ones’ own atmosphere. • Fugitives Drift Lodge. This is the most expensive, most upmarket and most famous accommodation option. Everybody I know who has been there speaks very highly of it. If you were planning to go, not overly concerned about cost given the relatively weak South African Rand and could not get Rob as your guide, this would be my recommendation. • Rorkes Drift Lodge. This is cheaper than the other two options and beautifully situated on the banks of the Buffalo River within viewing distance of the original Rorkes Drift. We stopped here for a beer after visiting Rorkes Drift, and I am sure that it would be more than suitable for purposes of providing comfortable functional accommodation conveniently located for the battlefields. There is a wealth of written and audiovisual background material on to Zulu battlefields. The best general history is, according to Rob, “The Washing of the Spears” written by Donald Morris in 1965. Thank you Ernest Hemingway for giving Morris the idea. The other essentials are what have been produced by David Rattray and Rob Caskie. David relays the full story of the Zulu war in his lengthy audiobook Day of the Dead Moon. Rob relays the story of in his book A day on the Anglo Zulu Battlefields and his DVD has the same name. If you are not going to visit Isandlwana and Rorkes Drift but nevertheless have any interest, you should get hold of these to listen/red/watch. If you are planning on going, it is good to have familiarised yourself with background material in advance. As mentioned, A soldier-artist in Zululand – William Whitelock Lloyd and the Anglo Zulu War of 1879 is a magnificent book. If you develop a real interest in this then I highly recommend this book, both for its coffee table attributes and as an engrossing read. Liz’s comment on our trip was “Not knowing a great deal of the history of the Anglo Zulu war I went along to accompany Jonathan, and with few expectations. Having listened to David Rattray’s tapes of the battles in the car on the way from Durban I was eager to find out more. Hearing the stories from Rob whilst on the battlefields was an intense and moving experience. The bravery and heroism of so many, on both sides, and the brutal way they perished, seemed such an unnecessary sacrifice in a needless war.